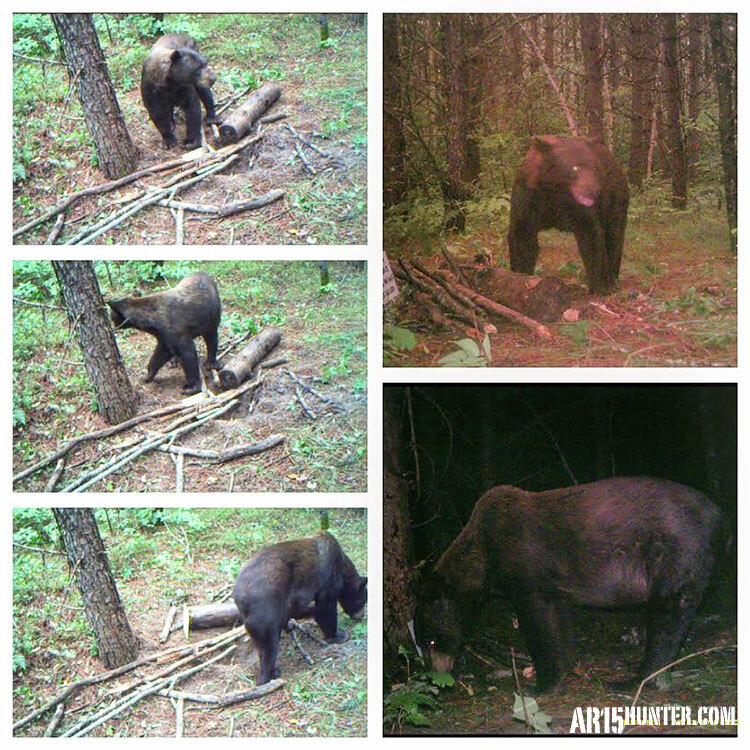 My guide and friend, Tim Humphrey, (owner/operator of Aspen Outfitters in Cass Lake, Minnesota), had been sending me pictures of giant bears for the two weeks prior to my hunt. 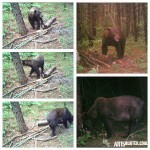 Of all the bears I saw in the pictures, one particular bear stood out. He was quite large, and had brown and blonde fur. Because of his looks, we named him “Chewbacca”, or “Chewie”, and I decided early on that I really wanted to try and take this unique bear. Early on, during the first sit in my ground blind (eye to eye with an animal that could kill you really ups the adrenaline! ), one small bear came into the bait and left. I knew he was small and not the bear I wanted, so the wait continued. Within an hour of the smaller bear leaving, Chewie came in, facing me, staring directly at me, the entire time he was eating from the bait pile. 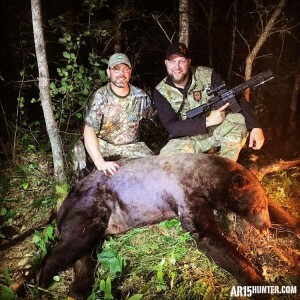 He looked like a Grizzly bear at 25 yards to me! It was at this point that I wished I had brought my .50 Beowulf, instead of the .300 Blackout AR15 Pistol. I had brought both weapons up to camp , but decided on the smaller caliber pistol, because it was the first sit and didn’t think that it would actually happen on the first evening! Chewie sat there eating and eyeing me for a good five minutes, and I knew as soon as he turned and presented the shot I was going to take it. When he finally did turn, I fired! He stood up and turned with the impact , I shot again, and he went over a bank down into the thick timber. I could hear him thrashing, and then silence. I sat for a bit to calm myself, then got up and walked to the road to call Tim. When Tim arrived he asked, “Is he dead?”. I said, “Yes, for sure. Two shots in the chest at 25 yards, he’s dead…”. At this point it was full-on dark. Tim, his son Logan, and another hunter that had taken a bear earlier in the day, walked with me into the bait site. I walked to my blind to recover my big flashlight. While I was doing so, I heard Tim yelling, “BEAR, BEAR! Matt, Matt, shoot him!”. I ran out of the blind, and flipped on the light that is mounted on my 300 Blackout! All I could see was glowing eyeballs rushing towards us! I fired once, and the bear spun and ran away! EXCITING, TO SAY THE LEAST! We left, with plans to come back a little later. 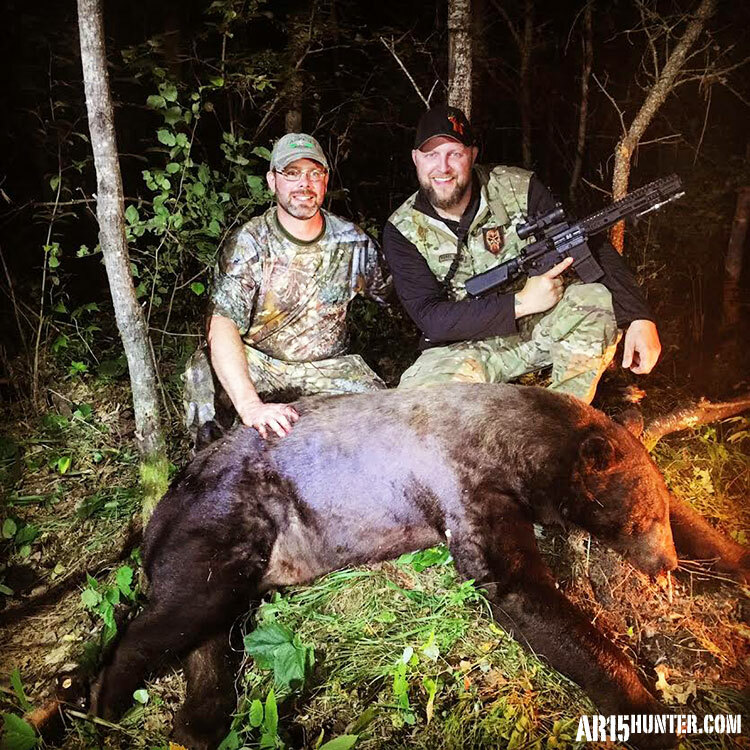 The Author & Guide with the Author’s Large MN Black Bear. We returned to the bait area a few hours later, and found Chewie dead. My initial 2 shots were both lung shots, and the 3rd shot went high into his chest and exited through the back leg, breaking it. 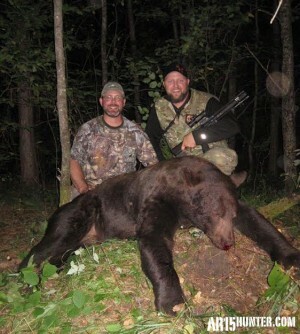 He was a beautiful, 320lb., Minnesota color phase Black Bear. 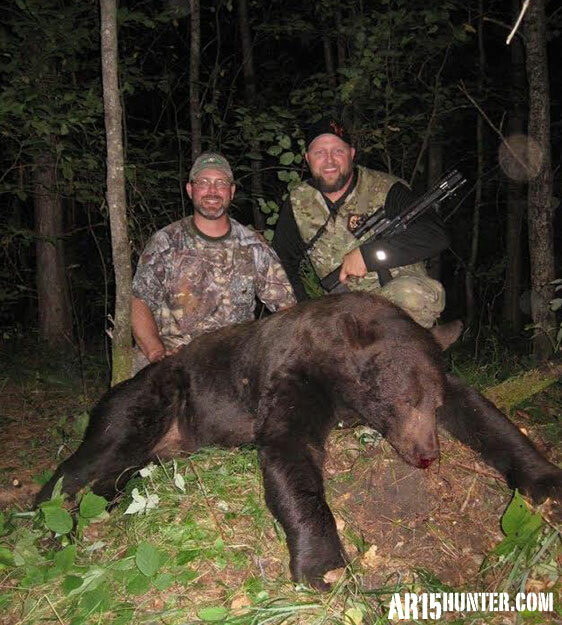 The lessons learned that evening, was NEVER assume the bear is dead, and ALWAYS take the big gun bear hunting. 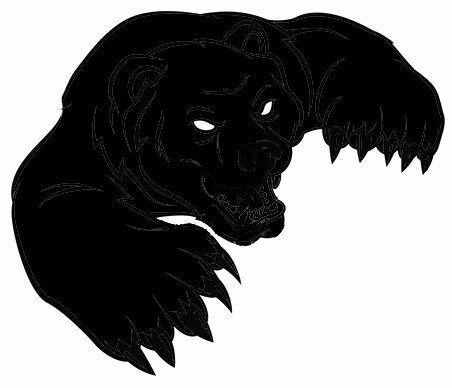 Although, I will admit, hunting Black Bear with an AR15 Pistol in 300 Blackout, will be an experience I will not soon forget! Another Shot of the Author’s Bear!